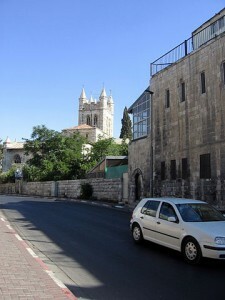 St George’s cathedral in Jerusalem. If you walk out the Damascus Gate of Jerusalem’s Old City, and go straight up Nablus Road (Derek Shechem in Hebrew)—past the Garden Tomb and the École Biblique on the right, the bus station, former US consulate and the British Council on the left, but not as far as St George’s Anglican Cathedral—within about 4 minutes you will come to the Jerusalem Church of the Nazarene. Over the years I have brought groups of students to Israel for study trips. I speak to them about the ‘mental maps’ we bring with us to Israel, and how those maps determine what we see. Readers who have been to Israel on pilgrimage may recognise certain of the places mentioned above, but not others. Most likely not the Church of the Nazarene. For most Christians the mental map is that of the time of Christ. Those who come on pilgrimage, or as part of studies, tend to look at the experience with that biblical map in mind as the focus is on the places where Jesus walked, or where Old Testament events took place. Orthodox believers move from church to church. It is possible to spend two weeks in Israel and live altogether in the past. For others the present reality will come as a shock—sprawling cities, traffic jams, and fast-food jostle alongside holy places crowded with the thousands of pilgrims all seeking the connection with the ancient stories and events. In the interest of disclosure, I should declare the influences on my mental map of Israel. A Red Crescent Ambulance being searched at a checkpoint into Jerusalem. The first time I visited the Nazarene church on Nablus Road was in 1988 in the early days of the first Intifada, or Palestinian uprising. As I was leaving the Israeli security forces were just setting up a road-block on what was then the main road into Jerusalem from the north. The soldiers were calmly leafing through papers found in one of the cars. Traffic was backed up as far as could be seen. It was not clear to me then, nor is it even now, what purpose the roadblock served. In 2004, I was living in the Old City during an earlier sabbatical, this time in the midst of the second Intifada. I was wakened one morning by the explosion of the Number 19 bus, packed with young people on their way to the university. Some of them may have been among the students—typical students—I watched getting on the buses to go home each evening. I could not understand then, nor do I now, what purpose the targeting of young people, Jew and Arab, served. The first Intifada was characterised by youth throwing stones at soldiers with guns; the second by the emergence of Hamas, suicide bombings, and the Separation Wall. 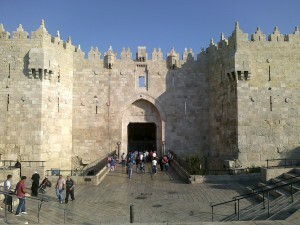 Old Jerusalem Street, with the Damascus Gate in background. Photo by James Emery. CC-BY. It is 2016, and I am back in East Jerusalem, this time in pastoral support of the church. 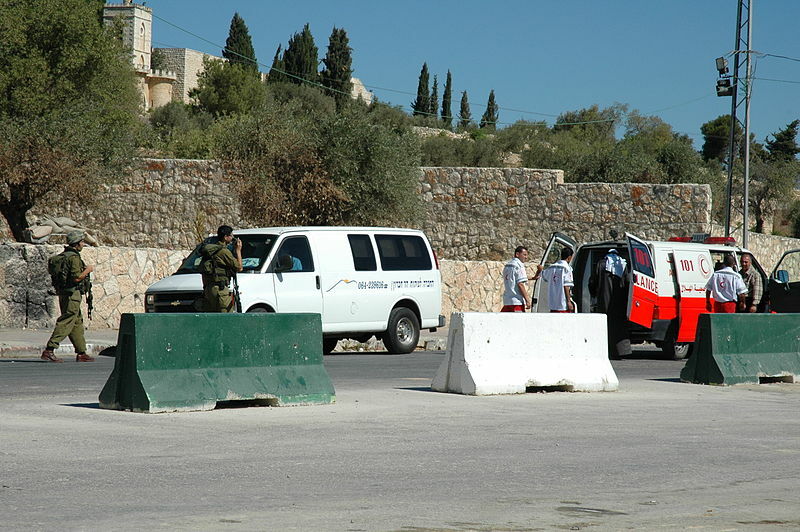 Last week a Palestinian youth attacked a Jewish youth outside the Damascus Gate—just 4 minutes’ walk from the church—with a knife, causing light injuries. According to the Israeli newspaper Haaretz this was the 33rd attack in Jerusalem alone in the past four months, in a phenomenon that the Israeli authorities are struggling to come to terms with. The incidents are most often knifings, and the attackers include young teenaged girls—not the normal terrorist suspects. They are clearly not coordinated or instigated by the ‘professionals’. But all are labelled ‘terrorists’. This is being called the third Intifada. This week three young men from the West Bank attacked security forces when stopped at the same point outside the Damascus Gate. One border police woman was killed. The three men were killed. They were found to have guns, knives, and pipe-bombs. This is feared to be the introduction of a new level of violence. These events frame my experience of the Israel/Palestine. They have re-written my mental maps over the years. In the coming weeks I shall post observations on life in Jerusalem, and Christian/Muslim/Jewish relations from the perspective of life in Jerusalem, and three decades of engagement with the Church here. The emphasis will be on observation, and does not propose to have answers to the problems, but rather to seek understanding. The challenge of life here is that one has to learn what mental maps the people one meets are travelling by. There are Israeli and Palestinian maps, for instance, that give different names to the same places and draw lines in different places. For many Europeans, particularly on the political left, the Palestinian map takes priority, and no legitimacy is given to other maps. For many Christians, usually evangelical and particularly Dispensationalist in eschatology, the Zionist map takes priority and there is no place for Palestinians in The Land. These are maps that mark the political fault-line that exists in Israel/Palestine as well, and there are variations and fault-lines on each side. There are no simple solutions, and even discussing the problems is like walking through a minefield. Yet, many of the issues facing Israel and the Palestinians today are tied in with the complexities of the Middle East as a whole; and, with the challenges which the refugee crisis brings to the West. As such, the reflections on the situation here are not just about another place. They are part and parcel of the interconnectedness of East and West, Muslim and Christian, and Jew.